Google is always changing the contextually aware cards displayed in Google Now, with new ones showing up whether from third-parties now, or from Google themselves. A new one has shown up, which is showing ‘Gas’ stations on your route. 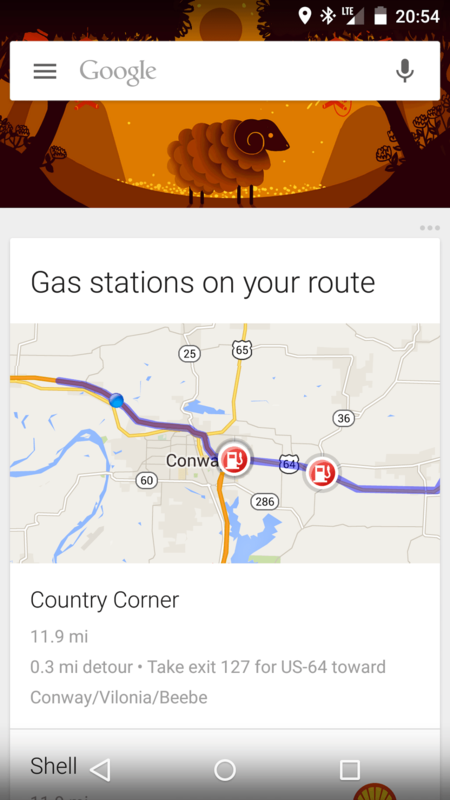 First spotted by Google+ user Kevin Mclauglin, the card shows a visual indicator of your route, showing any nearby Gas stations on the way, letting you know directions to the nearest one and how far it is out of your way to reach it. Obviously Gas is the US parlance for petrol station, so whether the title of the card remains if/when this card hits Australian Google+ users isn’t clear. There’s been quite a few cards which have shown up in the US but never made it to our shores and this could be no different. Have you seen a card with Petrol stations showing on your route? I hope it does change to “petrol”. Why Americans still call it gas is beyond me. Well it’s short for ‘Gasoline’, also known as petrol. Those crazy Americans with their shortened words! Eh, maybe I’m biased. I just always found it stupid. I seem to remember they were doing this for a very short time many years ago.